The coming boom in 3D television is set to be accompanied by a greater choice of 3D shooting still and movies cameras. Currently, Fuji is the only major manufacturer to have a production stereo digital still camera, in the shape of the Finepix W1, but with Panasonic having shown a new 3D professional video camera at CES, and Samsung displaying a working concept compact unit, more models are certain to follow. 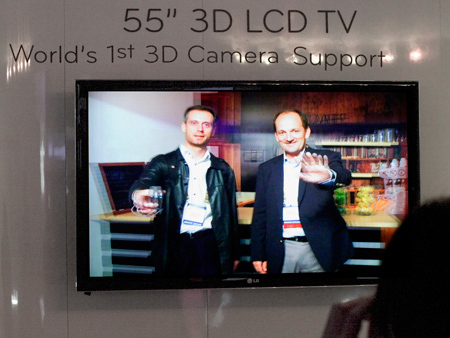 The coming boom in 3D television is set to be accompanied by a greater choice of 3D shooting still and movies cameras. Currently, Fuji is the only major manufacturer to have a production stereo digital still camera, in the shape of the Finepix W1, but with Panasonic having shown a new 3D professional video camera at CES, and Samsung displaying a working concept compact unit, more models are certain to follow. Panasonic?s dual lens 3D Full HD camera is aimed at high-end movie-makers but the Samsung?s unit, which bears more than a passing resemblance to Fuji?s will bring 3D shooting to a wider audience. Sony?s president has also stated that the company will become more involved with 3D this year, and not only in TV and gaming, but also in digital capture too. 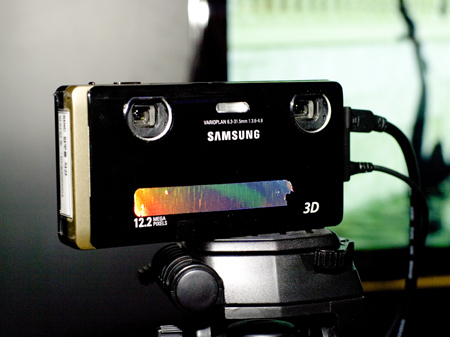 Samsung displayed a ‘working’ prototype of a 3D compact camera at CES. Electronic company LG were also showing the world?s first TV set that is capable of processing and displaying the MPO files from Fuji?s W1 camera, adding an extra viewing option beyond the company?s own 7in photo frame and printing service. 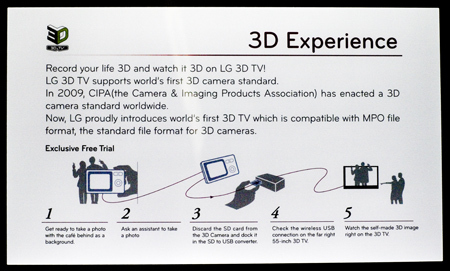 LG has not released a date when the new screen will be available, but a spokesperson suggested the second half of 2010. Most potential stereo camera makers will more than likely wait at least until the end of the year to allow 3D television sets to reach the market in significant volume before gauging how the technology has been received by the public. Whether the fact that there are three distinct technologies being employed in 3D displays at the moment will have an impact on how cameras are made we will have to wait and see.